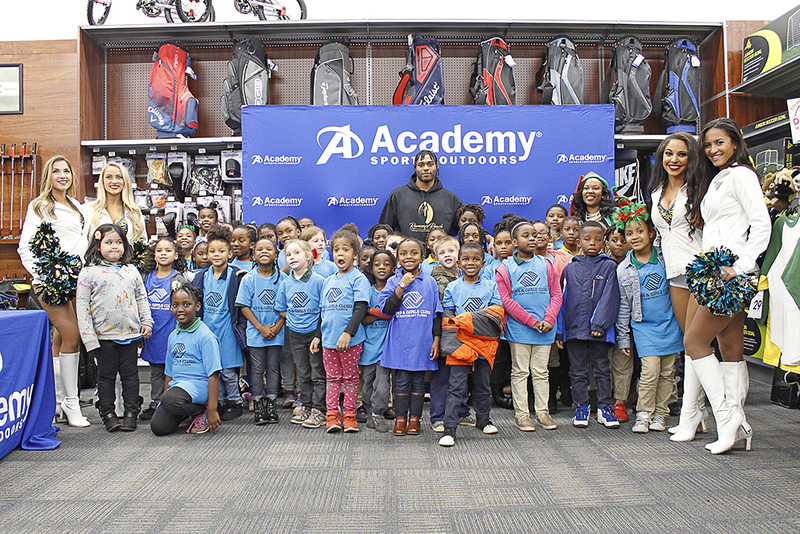 Jalen Ramsey, Jacksonville Jaguar corner back, shared holiday cheer with 50 Hyde Grove Early Learning Boys & Girls Clubs members on Monday afternoon, gifting each of the 50 children with a bicycle and a personally signed football at Southside’s Academy Sports + Outdoors. Hyde Grove Early Learning’s principle and staff showed their full support, helping the children stay safe as they awaited their turn to meet Jalen and receive their autographed football. After the students talked with Jalen about what they wanted for Christmas, the students were greeted by Jacksonville ROAR members to receive their new bicycles. Jacksonville Jaguars wide receiver Allen Robinson hosted the second annual Operation Elf event Tuesday, where 30 children from the Boys & Girls Club of Northeast Florida received a new bicycle and autographed football. Jacksonville wide receiver Allen Robinson donates bicycles and autographed footballs for Boys & Girls Club members. Members of the Jacksonville Jaguars celebrated Thanksgiving early by sharing a meal with the kids at the Boys & Girls Clubs of Northeast Florida (BGCNF) Monday.